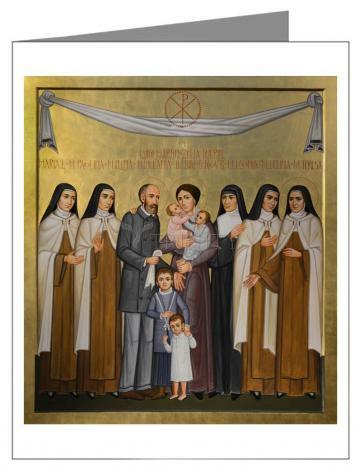 Louis and Zélie Martin, the parents of St. Thérèse of Lisieux, are the first spouses who were not martyrs to be canonized as a couple (October 18, 2015). Louis was a watchmaker, Zélie a manufacturer of point d’Alencon lace. They married in 1858 and had nine children. In this icon by Paolo Orlando they are pictured with the five daughters who survived to adulthood: Marie, Pauline, Céline, and Thérèse in the Carmelite habit, and Léonie in the habit of the Visitation. An inquiry into Léonie’s possible sainthood was opened in 2015.